Atlantic Richfield was formed in 1966 from the merger of Richfield Oil Corporation and Atlantic Refining Company. 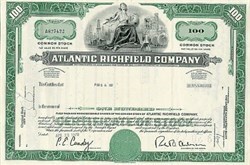 Atlantic Refining had been incorporated in 1870 and was one of the Rockefeller companies until the Standard Oil Group was dissolved in 1911. Richfield Oil had been founded in 1905. In 1963 Robert O. Anderson became the largest shareholder of Atlantic Refining when he sold his Hondo Oil and Gas Co. to Atlantic for 700,000 Atlantic shares. Anderson became Chairman of the Board in 1965 and in 1966 arranged the merger of Atlantic with Richfield Oil. Sinclair Oil was acquired in 1969. In the early 1970s the name ARCO (acronym for Atlantic Richfield) replaced the various other names at gas stations. Today Atlantic Richfield operates globally in the exploration, production and marketing of crude oil, natural gas and natural gas liquids, and the refining, marketing and transportation of petroleum products.